After attending her first Gay Liberation meeting in 1973, Ms McCrossin, was there right at the start of the long road to marriage equality. “If you had told me, as a young university student, it would take 44 years before we achieved the right to marry, I don’t think I would have believed it. After being treated for stage four cancer in 2013, she married her partner Melissa Gibson in Manhattan in 2014. Ms McCrossin, of Annandale, was appointed a Member of the Order of Australia (AM) for her significant service to the community, particularly through LGBTIQ advocacy roles, and to the broadcast media. The 64-year-old assumes the criminal record of her arrests and convictions still exists in a “dusty, paper file in a state government storage cupboard”. “However, I don’t think of myself as brave for standing up to unjust laws,” she said. “Fighting for change was a psychological necessity in that era. Many people took their own lives because of the hostility of family, psychiatry and faith groups. “Speaking out in the media and asserting that homosexuality was a normal part of human sexuality was a life saving experience. And it still is. 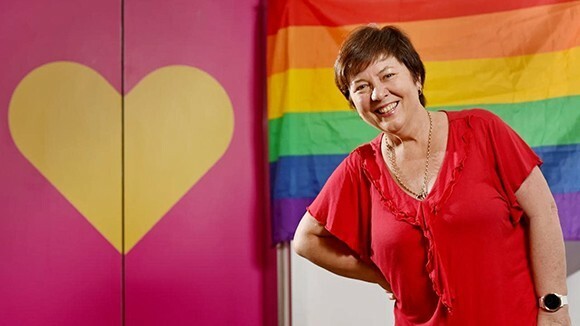 While the Uniting Church welcomes LGBTQI people, there is an ongoing battle to be accepted and welcomed into most faith communities. “The current demands for new legal protections for so-called religious freedom are a fight back from conservative forces in our community who oppose the acceptance of sexual diversity,” she said. Ms McCrossin is also well known as a broadcaster with ABC Radio National for 20 years. She was also a team leader on the media quiz show Good News Week on Network Ten and ABC TV for five years. “The highlight of my broadcast career was the first three years of the original Good News Week media quiz show on ABC TV in the late 1990s,” she said. “At its best, it was intellectual vaudeville with articulate guests from across Australia’s cultural, comedy and political communities. Julie McCrossin was arrested many times for her activism.